Brooks Brothers Brookstweed jacket, OCBD shirt, tie, and pocket square, Polo Ralph Lauren grey flannel trousers, Eddie Bauer socks, and Allen-Edmonds shoes. You must love Fall in AZ. It's probably in the 70's now, right...? Yes, Topsider, it's in the 60's or 70's here during the day and in the 40's or 50's at night. On the down side, finally seem to be getting over Pneumonia, which I've had for over a month. I voted on Thursday. They sell advertising space on the "I Voted" stickers here. It's on Brooks Brothers wide wale cord three button jacket (with patch pockets and welted edges) I got when Nixon was President. Wow...! No moth holes...? Amazing! It's missing the belt, but no holes. I did have to replace all the buttons, which had leather shanks and were falling off. Otherwise, it's a nice coat -- a true depression-era survivor. Today I was finally able to take the Chrysalis field coat I bought on sale at O'Connell's last year for a spin. Great looking outfit, Sartre, and a particularly wonderful jacket! Lovely coat, Sartre, and even better rust-colored cords. Such a wonderful Autumnal combination. Trying to look seasonal at Kierland Commons in Scottsdale AZ. Brooks Brothers camel hair jacket, pink OCBD shirt, tie, and belt, Squarextraordinaire pink polka dot pocket square, Orvis heavy cotton flannel checked trousers, and Allen-Edmonds shoes. Thanks, LeeLo. They are from Cordings. I had read about Bruce Boyer's fondness for Cordings trousers and had also been seeing Cordings featured on Salt Water New England. I stopped by the store on a recent trip to London and was sold. Amazing colors, in both corduroy and moleskin. And the cut is flat-front but with plenty of room in the thigh...yet the legs taper so your shoes are not swallowed up by your cuffs. 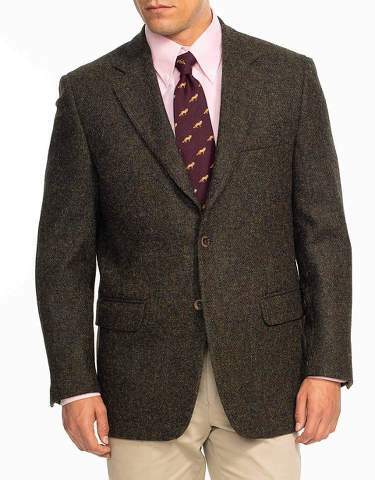 I'm not wearing it, but a friend of mine's in town, sporting a new J Press Harris tweed jacket, and it is a handsome thing. Hook vent, just the right amount of shoulder, and built like a young tank. As it's about 12 degrees outside, Thos. is glad to have it for multiple reasons. He bought it at the D.C. store, and for some reason they threw in a tattersall sports shirt. Must be that Washington go-getter thing. Now that's good stuff LeeLo. I had that jacket once. Part of the a four-jacket haul, referenced in the great thrifting thread I just started. Thanks, Patrick. A four-jacket haul!? I wish I was that lucky. More Donegal tweed for me today (however, it's not of the "Mist" variety).